Next month will mark the 36th anniversary of Roe v. Wade, the flawed U.S. Supreme Court decision that overturned most laws restricting abortion in America. The official anniversary will be Jan. 22, two days after another historic milestone, the inauguration of Barack Obama as the nation’s 44th president. These two events should provoke serious national reflection on how to address the tragedy of abortion in this country, which Pope John Paul II rightly characterized as an affront to the dignity of the human person, undermining the very fabric of society. While access to abortion is protected by judicial fiat, there are several strategies the new president could employ that would reduce the number of abortions. He could appoint justices to the U.S. Supreme Court committed to the sanctity of human life and to a more reasonable and moral view of the right to privacy than the one expressed in Roe. He could keep in place the restraints on abortion imposed by executive order during the George W. Bush administration. He could veto the Freedom of Choice Act, in the event that it reaches his desk, and he could fight any effort to repeal the Hyde Amendment, the federal law that bars the use of federal funds to pay for abortions. Mr. Obama should do all of these things. He is not likely, however, to do any of them. That is political reality. Though pro-life activists should not exempt the new president from moral suasion, nor abandon efforts to end access to abortion by all legal and moral means, they must realize that Mr. Obama is not at all likely to pursue policies that several committed pro-life presidents like Reagan, George H. W. Bush and George W. Bush were either unwilling or unable to adopt themselves. The prudent question that pro-life advocates should pose is, What could we ask Mr. Obama and a Democratic Congress to do that they might actually do? Given that the abortion rate, according to the pro-choice Guttmacher Institute, among women living below the federal poverty level is more than four times that of women living 300 percent or more above the poverty level, pro-life activists could work with Congress and the president to provide low-income women with health care, childcare, housing, services for disabled children and other basic supports young women especially need. Mr. Obama, in turn, has an ethical obligation to work with pro-life activists and others to address the problem. Aside from his moral duty to protect the unborn, the new president also made a campaign promise. During his acceptance speech last summer at the Democratic National Convention in Denver, Mr. Obama pledged to bring people together across traditional political divisions, adding that “we may not agree on abortion, but surely we can agree on reducing the number of unwanted pregnancies in this country.” The new president should honor this commitment by engaging in a serious, sustained dialogue with pro-life advocates, recalling that his mandate for change does not necessarily reflect a national consensus on every issue, let alone the most divisive ones. Over one million abortions were performed last year in the United States; over 45 million have been performed since 1973. These statistics assail the conscience of the country. We must act now to reduce seriously the number of abortions and unwanted pregnancies in the United States by seizing the current moment of national unity engendered by Mr. Obama’s historic victory. On the whole, I agree with your comments on working with the new President on reducing abortions. More children have been lost to limits on public assistance than have ever been lost in third trimester partial-birth abortions (which are extremely rare - if they occur at all). As legal abortion is the status quo, the burden to act is on the pro-life movement to propose change, rather than on Mr. Obama and his supporters to justify the current state of affairs. (This would not be so if the issue were legislative legalization of abortion). I do quarrel with your assumption that the privacy component in Roe v. Wade was wrongly decided. The Court was rather clear that privacy hinges on the child's lack of independent legal status. 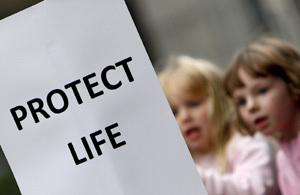 It is therefore up to the pro-life movement to propose ways to change this status. This is not as simple as it sounds, since granting full legal status ups the the ante in enforcing these rights. Abortion would be considered legal murder, with corresponding penalties. There is no returning to the status quo before Roe. Until the pro-life movement realizes this, its arguments in the legal arena will go nowhere. Legal rights would also carry with them the right to sue for wrongful death in the event of an unsuccessful pregnancy, which would seriously burden the practice of obstetrics and the health of mothers and children who have no intention of participating in abortion, as obstetricians would hold off on seeing patients until after most miscarriages occur to avoid lawsuits. In countries where abortion is illegal many doctors will not perform a D&C when the child has already died in order to not run afoul of the law, as this is considered abortion. There are reports of some Chancery offices in this country with confusion on this issue as well - so don't say it won't happen here. When the National Right to Life Committee and the USCCB seriously face these issues in their proposals for a legal position, they will find that more Catholics in the pews will take the life issue seriously. We feel no obligation to do so, however, without a serious proposal on the table. Mr. Obama himself said that he will work to make third trimester abortions illegal, provided their is a reasonable health exception (which would be tighter than the current Doe v. Bolten exception). A starting point would be to work with him on that, including giving obstetricians the same deference that we give to surgeons in dealing with conjoined twins and other difficult cases where life is at risk. Are you suggesting that it is not possible to remove an unjust Law and work to overcome poverty at the same time? That makes no sence. Why do you believe that it is not possible to remove unjust Laws and work to overcome poverty at the same time? What a refreshing perspective. The article suggests a reasonable, balanced, pragmatic and achievable approach to a very complicated issue. To your question , "What could we ask a President Obama and the Democratic Congress to do that they might ACTUALLY do regarding Abortion", I'm afraid the answer is NOTHING !!!!! President elect Obama was given hundreds of thousands of dollars by Planned Parenthood for his campaign. He is going to do NOTHING that would curtail their support in the future. They make so much money via actual abortions that reducing pregancies is not in their best interest. I believe their motto is: "Send us your unwanted pregancies, we'll elimate the embryo, send the girls back to get pregnant again...... send them back to us and on and on and on ." He has stated if one of his daughters "Made a mistake" and became pregnant he would want an abortion available to her. And we KNOW how he feels about Infanticide and late term abortions!!! The fate of the DIGNITY of Human Life realized a TREMENDOUS blow this year. GOD HELP US !!!!! I fail to see the logic in simultaneously signing the FOCA and claiming to be working to reduce the number of abortions. Abortion like slavery is morally indefensible. Both are intrinsic moral evils, always wrong. Slavery was ended at an enormous cost. Human life does not become more sacred as it progresses in development It seems that mankind has always struggled with the question: who is a person? But we are always sure about one thing. I AM, Perhaps you’re not but I AM. The great I AM. We'll all meet in these pages after his first term an take stock of his sucess in reducing the number of abortions since you raised the point. There is no law allowing abortion at the federal level, there is a decision that states that women have a privacy right vis a vis the states so long as the fetus is not recognized as a legal person. The burden of proof is on the pro-life side to devise a method to provide status to the unborn through the competent legal authority to do this, which is the United States Congress (not the states and not the courts). This is conceptually harder than most in the pro-life movement believe, as you must do so without putting OB's out of the business of prenatal care. Any fetus with legal recognition would have full equal protection rights, meaning criminal penalties (rather than fines to shut down abortion facilities) would be involved in taking their lives, including penalties against the mother. The fact that this was not the case previously testifies to the fact that there was no recognized "right to life" before Roe v. Wade. FOCA is a cannard which is never, ever going to pass the Congress. The promise to pass it was empty rhetoric designed to lure Clintonistas. It worked and will now be forgotten by anyone but Obama haters. I am eager to work with concerned citizens along the entire political spectrum who care about the health and dignity of both women and children. I understand the desire to overturn Roe v. Wade; I have marched in Washington twice myself on January 22. At the same time, though, I believe that we must have an holistic approach to promoting a culture of life. That means: focusing on issues related to health care and education, among others, so that human beings can flourish long after they are born. Will we let disagreement about Roe v. Wade divide us? Or might we acknowledge that people who differ politically can work together on behalf of the same, life-giving values? I believe in our nation's people that yes, we can! AMERICA's editors need a reality check. Abortion is not a money problem, it is a moral one. There is no evidence, from the Guttmacher Institute or anywhere else, that poor women choose to have abortions because they lack health care, childcare, etc. Poor women routinely have all of these resources at their disposal; in fact, they are often more advantaged than less poor women who have to pay for their families' needs out of their own pockets. There is no shortage of funding for adoptions; there is a shortage of adoptable babies, because our culture teaches mothers that it is better to kill an unwanted child than give it up. And the only commitment that President-elect Obama has made and intends to keep is that he will make sure that abortion on demand remains the law of the land and the preferred option for inconvenient pregnancies. The truth is not a matter of opinion it is a fact: From the Declaration of Independence, in Congress, July 4, 1776. A Declaration by the Representatives of the United States of America, in General Congress assembled. "We hold these Truths to be self-evident, that all Men are created equal, that they are endowed by their Creator with certain unalienable Rights, that among these are Life, Liberty, and the Pursuit of Happiness..." The very first Right listed is the Right to Life, without which there could be no other Right. This Right is an unalienable Right. Here are the only facts you need to know regarding the Right to Life of ALL men: (From the Merriam-Webster Online Dictionary) man 2a: individual, person (men,plural of man) person 1: Human, individual individual 1b: to make a distinction between At Conception, there exists a unique individual, with unique DNA, consistent with the DNA of a Human Person, separate from that of its Mother. I rest my case. Who can argue that we do not know the definition of a Person? A Pro-Life Catholic for Choice is an oxymoron. "We hold these truths to be self-evident, that all men are created equal, that they are endowed by their Creator with certain unalienable Rights, that among these are Life, Liberty and the pursuit of Happiness." Why are humans in embryonic states in the United States denied the 'unalienable right' to pursue Happiness? Isn't this the purpose for which the country was founded? Therefore, shouldn't the US constitution insure that said right be fully respected? Given that Christians are a mayority in the United States, shouldn't organizing to ammend the constitution be the highest priority in the strategy to stop abortions? Surely, this would not only impact the United States but also the entire world. Not doing so also will. "pro-life activists should take seriously Mr. Obama’s promise to find ways of reducing abortions short of outlawing them", however his statements to an abortion rights group promising full support of FOCA, a bill that he proudly cosponsors, and his own record of voting to deny medical attention to a child born alive after an abortion attempt according to the editors of America along with Catholic Professors Kmeic and Kavanaugh are to be ignored by Catholics, mere fund raising devices and a rallying cry for pro-choice groups, not to be taken seriously. The arguments presented by the editors to justify their attempt to paint Mr. Obama as simply a political animal, willing to promise full and unswerving support to all forms of abortion, at any time, any place, including Catholic hospitals and facilities are simply preposterous suppositions of how he might act in the future not withstanding his proven record. Are the editors unaware or actually not familiar with the full extent of Barack H Obama's position on abortion, partial birth abortion and opposition to providing prompt and caring medical attention for a child born alive after a botched abortion attempt. Any mother who knowingly leaves a new born in a dumpster or on a street corner is committing a crime and those who deliberately allow a new born to die with a doctor present are just as guilty. The editors obviously seek to reach some accommodation with Mr. Obama, a negotiated truce promising fewer abortions by more government good works an approach Jesus Christ rejected, negotiate with evil, when he rejected the devil's temptations three times. Like the devil, Mr. Obama wraps his abortion views in terms that are intended to lure Catholics into negotiations or acceptance of abortions for a promise of good faith efforts in other areas. Apparently some 'Catholics' with their subjective conscience have swallowed Mr. Obama's lure. How would history treat Churchill, Roosevelt and Pope Pious XII if they had tried to negotiate a lower extermination rate of jews, the mental and physical handicapped, religious of all faiths and communists for promises of better treatment their POWs and forced laborers? For you will have the poor always with you" Matthew 26.11 and nowhere in the New Testament does Jesus Christ lay the responsibility for caring for the poor, the sick the hungry or thirsty, the homeless or any oppressed people on any governmental body. He did not cite King Herod, the priests of the temple, the local mayor or the Roman powers as the source of Charity. He made it an individual responsibility time after time in His sermons, in His parables and in His own acts. The Good Samaritan was not an example because he stopped at the nearest inn and asked that a 911 call be made but because he acted. Jesus Christ said "My kingdom is not of this world" and those who attribute, "Free health care, affordable housing, quality education, living-wage jobs, peace initiatives, protection of the environment? and "If you build a great society with peace and justice," seem to be unaware or ignore that Jesus Christ's teaching of the two greatest commandments, "Love God" and "Love thy neighbor" were directed to each and every individual, not to any state or government entity. Support for one who promises to have the government do good works while also promising to support each and every pro-choice position may salve one's conscience but may not save one's soul. Enrique, its not as easy as changing the Constitution (not that this is easy). One must draw the line between protecting the unborn under color of law and making it possible for the practice of obstetrics to occur. If there were no such thing as a miscarriage, this would be fairly easy. However, it has been shown in nations with restrictive abortion laws that sometimes women can't get a needed D&C when such tragedies occur because doctors are afraid of coming under examination for violating these laws. If a fetus is recognized as a human being, every time one dies it is a public event. That is what equal protection of the law means. You can't have legal recognition which stops abortion and doesn't hamstring obstetrics with investigations and lawsuits, or the fear thereof. I offer the example of the extremely pro-life former Attorney General of Kansas who is currently going after planned parenthood. I don't want someone like him as my local prosecutor, do you? Yet if the unborn were considered individual legal entities at conception, or even gastrulation, his ilk would be empowered to investigate every D&C (or file suit, likely to be settled from much higher malpractice insurance, every time a miscarriage occurs). That is what equal protection under the constitution means - that a fetus would be just like you and me in regards to lawsuits and the manner of death. Now, some say I am being an alarmist. If I am, it is because National Right to Life has not proferred a human life amendment that meets these concerns. The burden is on them to do so. There is a right way and a wrong way of doing things and abortion is wrong. Just as sexual promiscuity is wrong. This being so one way of reducing abortions is by eliminating sexual promiscuity. There is no such thing as SEXUAL FREEDOM but sexual responsibility does exist. And by responsible I do not mean birth control; I mean self control. When the American people learn once again to be sexually responsible then the murder of the unborn will cease, not before. Sexual responsibility may curb abortions to singles, but it does not begin to help married couples in need of higher incomes to afford more kids. Also, I put to you that if there were a clear pathway to an education while married with a baby which allowed both a middle class life style now and a future later, more girls would demand marriage when pregnant and more boys would become sexually responsible. I agree that though the article is vaguely pro-life, it is not strong enough. I, too, hope that this article will serve as a pointer to more concrete efforts by the editors of America. I also hope that the editors will contact our newly elected President and ask him to fulfill his pledge to reduce abortions. President Obama owes the editors of America a great deal for their pre-election coverage of the campaign. Not a timely response, but... An unexpected/unplanned pregnancy, of course, is not necessarily an unwanted one. To understand that the pregnancy will result in considerable hardship also does not mean that the mother could, or would, walk away from her child. The love that some women feel for the baby long before it is born can give her the strength to fight the odds, or at least endure. With all our condemnations of "unwed mothers", there is a tremendous amount of outright heroism among this group -- and some powerful lessons about real love. All of that said, we need to examine why women might choose abortion. The leading cause is economic, followed closely by the level of self-righteous contempt that Americans in general show toward our poor, and specifically toward poor families that were abandoned by men. We tore out the social safety net, replacing it with a long list of primarily punitive measures (even though it was the father, not the mother, who abandoned the child). Whereas most modern countries recognize all babies as a valuable resource for the future, we see them as a disgusting burden (even though each taxpayer contributed only pennies per year toward AFDC). And we do cling to a Puritanical hate for these fatherless families, which enables us to feel superior. Of course, not all single parents must turn to welfare, but our interest is only in those who do. Being a single parent in a country that has virtually no social supports means that poverty is likely for a single parent. Americans were taught, via the media, that poverty is merely a "lifestyle choice" -- one that inconveniences the hardworkingamericans (today, this is said as a single word), equated with living a life of lazy luxury. Of course, the public also swallowed the numbingly illogical myth that subpoverty-level welfare allotments provided such an easy life that people simply didn't want to give it up. At any rate, my point is that hate against our poor, combined with the hardships imposed by punitive policies, makes it easy to regard abortion as a reasonable and compassionate choice. The hardships imposed by current punitive policies actually increase the likelihood of failure. Unless you have a good reserve of money and a circle of people who can help with such things as filling in with child care, an unplanned pregnancy will result in years of extraordinary hardships for both parent and child. Most women know that, if they carry the pregnancy through,they will not be able to give away their baby. (Criticize this all you want, it remains reality.) Given conditions in the US today for the average single parent, it is not difficult to see why they would regard abortion as the most compassionate, reasonable choice. America does want to have scapegoats; in comparison, this enables most of us to feel superior to someone else. By definition, a scapegoat must be a person or group that lacks the power to strike back. Single parents are our national scapegoat of choice, and there is no incentive in government, media, etc., to work toward changing this. We've embraced policies that make it far harder for this group to work their way out of poverty -- indeed, almost impossible to do so. We don't approve of what they have done, and are clearly determined to punish them and their children. Because of all these factors, abortion is increasingly regarded as the most viable choice for women who become pregnant under these circumstances. This won't change unless there is a change in perspective in government and the public --a more realistic look at these families -- and I don't expect that to happen for a long, long time. It can only start if someone, somewhere in the media, launches an honest discussion about it, and somehow brings that discussion into the mainstream. This article also appeared in print, under the headline "The Art of the Possible," in the December 15, 2008 issue.